Below are the results from the annual Cleveland Collegiate Regatta (name changed from the Home Schools Regatta in 2011). The race is held as a tune up each spring for the college teams rowing out of the Cleveland Rowing Foundation boathouse. Neither John Carroll University nor Cleveland State University participated this year. Therefore, Case Western Reserve University raced the Men's 8+ uncontested and claimed the Cleveland Cup this year. The women's team from Ohio Wesleyan were originally invited to participate in the regatta, and they still raced eventhough JCU and CSU decided not to attend this year. This year only the Men's Varsity 8+ counted toward the Cleveland Cup since the regatta was uncontested. Case entered a 1V and 2V eight, which raced approximately 2000m between the railroad bridges upriver from the boathouse. Weather was sunny and in the mid-30s deg.F with calm winds. 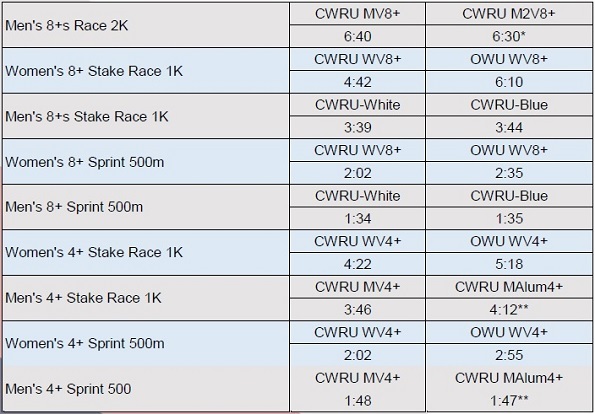 Below are the results for the men's races and women's races against OWU. The alumni regatta was held in conjunction with the schedule events, and those results can be found here. Combined team photo with CWRU and OWU. ** As always...regardless of the flagrant and shameless jumping of the start, the Alumni always seem to win. Thanks alumni for your support!